Now that President Obama and his aides have announced their plan for the United States to withdraw its troops from Iraq by August 31, 2010, they must consider what the forces engaged against the coalition and the Iraqi government plan to do in this time. Iran and Syria, as well as al-Qaeda and other jihadist groups, can affect the withdrawal road map. According to senior American officials, the Iraq War will unilaterally come to an end on the noted withdrawal date, unless dramatic developments force another strategy. As former President George W. Bush declared "mission accomplished" after the removal of Saddam Hussein in 2003, President Obama has now declared the end of "all counter-insurgency missions" by 2010. After that date, from the 142,000 marines and army personnel, some 35,000 to 50,000 troops will remain and will be ready to deploy in counter-terrorism missions. Under the Status of Forces Agreement with the Iraqi government, all United States forces must be removed by December 31, 2011. Train, equip and advise Iraqi security forces. Support civilian operations in Iraq aimed at reconstruction, redevelopment and political reconciliation. At first sight, the plan seems sound and answers a main requirement of American strategy — maintaining political gains made by the Iraqi political process and pursuing the fight against al-Qaeda and other terror groups. But the public and legislators should realize that for the next stage to be successful, Iraq must be able to withstand any future pressures by the "enemy." If the terrorist forces operating against the coalition and the Iraqi government are to vanish as soon as the United States pulls out, the withdrawal plan (any version of it) will be smooth and successful. It would merely be a question of logistical management. But any strategist must ask: what if the other side won't cooperate? What if al-Qaeda and its Salafi ilk, as well as the Iranian Revolutionary Guards Corps, the Quds force, Hezbollah from Lebanon and the intelligence services of Tehran and Damascus decide otherwise? What if they continue operations from now until August 2010, and after that date, endlessly? A logical American response would be to focus on enabling Iraqis to fight a counter-insurgency war and grow their capacity until withdrawal 18 months from now. By the magical date of August 31, 2010, Iraq's own forces should be able to control their county. 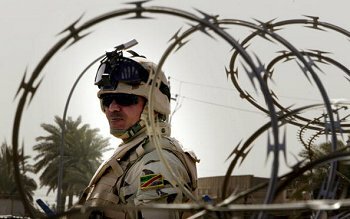 The role of the United States expeditionary force should be to wage counter-terrorism missions in support of the Iraqi armed forces if the insurgency continues past that date. It is difficult to predict what all of the United States' "foes" in Iraq will do. The easiest guess is about al-Qaeda and the other jihadists. All their literature and statements, as well as actions on the ground, show that these forces will continue their attacks, regardless of both American and Iraqi planning. The Salafi combat groups, despite their containment by the Awakening Councils and by counter-insurgency activities, have the Sunni Triangle in sight for as long as the "will of Allah" prevails. Hence, their aggression against Iraq's population and institutions is expected to last as long as their ideology and ideologues last. Just as important to the jihadists are their strategic lines into Iraq. They cross the Syrian border constantly and are backed by ideological and financial circles inside Iraq's southern neighbor, Saudi Arabia. Thus, the success of the Obama plan will hinge on the capacity of his administration to stop the flow of jihadists from Syria and Saudi Arabia. A more complex prediction is about Iran's plans for post-American withdrawal. Many in Washington are excited to report that realism will prevail in Tehran as soon as the Obama administration sits down with the mullahs and engages in "talks," which might even involve "listening." In short, the group recently coined as the "Iran Lobby in the U.S." is arguing that withdrawal plans will get no opposition from Iran. Everything will go smoothly and Iraq will be able to control its eastern border, pro-Iranian groups notwithstanding. I believe otherwise. Iran's leadership will sit down, talk and sometimes listen — but it will at the same time continue its actions on the ground until it fulfills its own mission. And that is to penetrate, influence and seize 60 percent of Iraq from Baghdad to Basra as American forces withdraw, and certainly after the pull-out. They will use all the power elements at their disposal — special groups, the Mahdi Army, assassinations, and government infiltrators. Thus the success of the Obama plan will hinge on the United States' ability to deter Iran, and its ally Syria, from surging against Iraq's democracy while America is organizing its departure. Is the 2010 plan doomed? Not at all. It is actually a challenging one and could be successful, but it is conditioned by the greater context. Withdrawing the bulk of American forces from Iraq after five years of deployment is long overdue, especially if the troops will be used on other fronts. Vice President Joseph Biden recently said the Iranians may be surprised where many of these forces would be used. The Obama plan can work if his administration moves quickly to deter both Tehran and Damascus from filling the void in Iraq. This is the secret equation hovering over all three plans the president has to choose from. If asked, I would advise the shortest stay for the bulk of United States forces in Iraq so that they can be engaged in other spots, not only in Afghanistan. The worst course of action would be to diminish the forces in Iraq while encouraging Iran and Syria — directly or indirectly — to "assume responsibilities" on Iraqi soil. This would be known by historians as suicide. In the end, all is in the hands of President Obama. If the president has a global plan to relentlessly wage campaigns against jihadist powers and forces around the world while winning a war of ideas, the 2010 plan for Iraq will be a stunning move. But if all efforts of the administration are to pull out from the confrontation with jihadists, conforming to failed academic advise of the past, the announced plan will be no more than the beginning of a retreat. Dr Walid Phares is the director of the Future Terrorism Project the Foundation for the Defense of Democracies, and the author of "The Confrontation: Winning the War against Future Jihad."